The Fuel Web featuring e-Fuel for maximum efficiency in fuel delivery. Let us bring out your inner geek. Change can be hard so The Fuel Web partners with you to make the change work. e-Fuel is a low cost, low risk system; start up and run parallel with your current system. Because we are a web service we can see what is happening on your end and offer solutions. 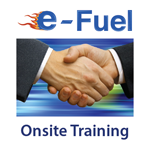 We offer training webinars, help screens, 'how to' popups within the e-Fuel application and onsite training. We will be adding a blog within e-Fuel in April 2014 to discuss current and upcoming e-Fuel features and how your company can make the most of them. Our customer service team has over 10 years of experience with installation and start up of e-Fuel, helping companies of all sizes to quickly gain confidence while using e-Fuel for propane delivery. Dealing with one knowledgeable source for all training services and questions creates easy and reliable communication, and the ability to quickly resolve any issues. We will be there when you need us. e-Fuel Tank Monitor Deployment Training Webinars concentrate on tank monitor deployment while giving you an overall familiarity with the e-Fuel system. e-Fuel, Tank Monitors, Accounts, Customer Service Notes, Reports, Documents, Help Page. Areas covered include user settings, navigation and search functionalities for My e-Fuel, Accounts and Tank Monitor Status. Tank Monitor deployment including organization, install logs, posting monitors and customer follow up. Creating Customer Service Notes. Using notes for reporting, documenting, and searching customer service cases. Closing a customer service case. Resolving Tank Monitor Issues. Using e-Fuel's reports and search functionalities to troubleshoot any issues with the tank monitors. e-Fuel Delivery Management Training Webinars will help you become efficient in the use of the main processes of the delivery application. e-Fuel Overview. The focus of this session is to learn what the site is about and how it is organized. Overview of My e-Fuel, Accounts, Delivery List, Delivery Sets, Mapping, Delivery Reports and e-Fuel Mobile. System settings, truck setup, delivery zones setup, delivery zones calendar setup. Tank Management Console and customized settings, scheduling methods and impersonations. Delivery Set and Delivery List, Delivery Maps and e-Fuel Mobile. The Onsite Training Sessions are provided for Tank Monitor Deployment, Delivery Management and Mobile and can be customized to fit the needs of your company. Our training sessions are designed to provide users with a structured format in which to become familiar with e-Fuel.